Location, Comfort & Amenities! Could this be the highlight of your vacation? This home is awesome! Located on a quiet cul de sac within walking distance to restaurants, shopping, entertainment and beaches, the open floor plan, spacious rooms, and wrap-around deck are just the beginning. High-end materials and excellent craftsmanship, along with tasteful decor help to create a comfortable space that is begging to be enjoyed. 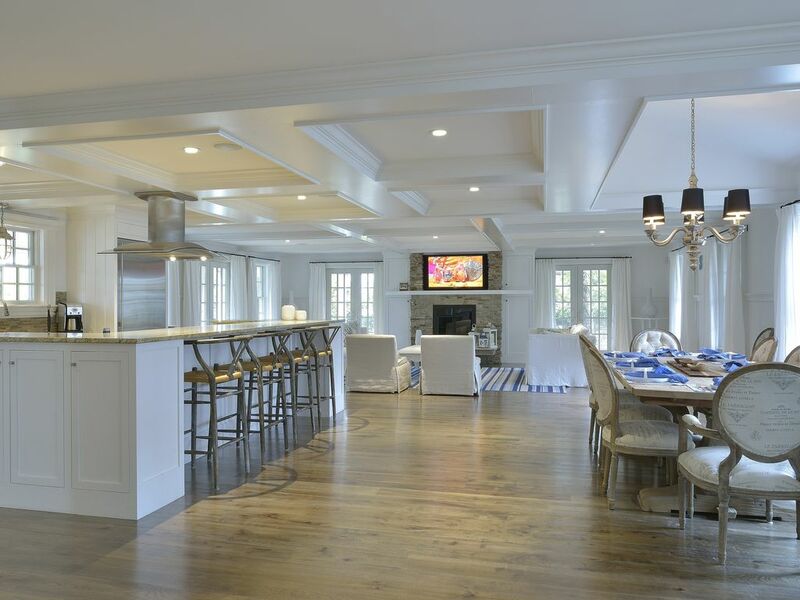 The first floor provides ample space to gather together in the great room, which includes the dining area, large kitchen with high-end appliances, granite counters, island with bar seating, custom cabinets, access to grilling on the side deck, and living room with fireplace and French doors to the back deck. A large laundry room, powder room, and den complete the first floor. Two en-suite bedrooms situated in the front section of the second floor are separated from the master bedroom by a hallway that provides access to a walk-in closet and gorgeous tiled bath. The spacious master bedroom has a sitting area, fireplace, and cathedral ceiling. The finished basement has two en-suite bedrooms, family/media room with fireplace, wet bar, ping pong table, and exterior access, storage areas, and a second laundry room. All bathrooms are finely appointed with Carrera marble. The outdoor shower is accessible from the basement and first floor areas. Having a wedding on Nantucket? This would be a great place to house the bridal party! Originally from Michigan, Nantucket captured my heart in 1989, and I have been a year-round resident since 1996. I met my wife when she first came to the Island in 1993, our three children were born here, and anyone who has visited knows that there is something about Nantucket that gets under your skin. I became the Town Crier in 2011, which has given me the opportunity to experience the Island in a new and exciting way. Of all the properties we looked at, this one stood out and was in a league of its own. We liked its newness and openness, the fact that it has a space where a group of friends can enjoy one another's company, and every amenity it has to offer. In a word, we thought it was "awesome!" 5 1/2 bathrooms plus outdoor shower All bathrooms finely appointed with Carrera marble. The house and location are amazing. A 10 minute walk to town, which was do-able even for my 83-year old father. A perfect spot for a multi-generational family and/or other groups for vacation. The main living area is spacious and perfect for spending time together but also roomy enough that you don't feel too crowded. That being said, there was extensive water damage to the flooring on the lower level (which was far worse than what we expected). The older folks in our family could not navigate the uneven and buckled flooring in the basement AT ALL, which made the lower level of this property completely inhabitable to part of our group. Things happen, and I understand that the buckling of the flooring due to a burst pipe was perhaps too big an issue to fix before our stay, however for the cost of this rental, I would have expected some sort of compensation because the house was truly not as we would have expected for the price. That being said, the location was so wonderful we probably would rent again, just with the stipulation that the basement floor be fixed. For any future tenants interested in this home, the entire basement floor has been replaced as of September 2018 and is completely perfect, as it was prior to the leak. Thank you. The Town of Nantucket requires recycling; instructions are included with the rental. There is a $200 deduction from the security deposit for failure to comply. Changeover day is Saturday. Check in 3:00 p.m. Check out 9:00 a.m.